As Indonesia prepares for the presidential election in July, one of the big questions concerns defence and security: in particular, to what extent will Indonesia’s new president reshape Indonesia’s future strategic policy? Here, I’m not going to debate what ‘strategy ’ or ‘strategic policy ’ [PDF] is. Rather, I want to provide an answer to the question outlined above. Drawing from Kenneth Waltz’s  theoretical analysis, I’ll explore those factors shaping Indonesian strategic thinking at the international, regional, national, sub-national (domestic), and individual (personal) levels. At the international level, the big question is obviously where Indonesia stands in relation to the more intense geopolitical competition unfolding between China and the US—with China potentially drawing increased support from Russia and US allies supporting its rebalancing to Asia. While Washington has consistently said that its rebalancing strategy is anything  but containment , China is increasingly sceptical  about such claims. Caught in between, Indonesia seems to know better what it stands against than what it stands for. For instance, Jakarta’s initial reaction to the announcement of the US Marines deployment in Darwin was revealing—suspicious  at best and conspiratorial  at worst. But it’s also worried  that China might be bent on changing the status quo and undermining America’s stabilising presence in the region. While ‘hedging ’ can aptly describe such an attitude, it seems at the moment Indonesia is more intent on dodging a critical strategic question  that it must answer sooner rather than later. In its hedging strategy  [PDF], Jakarta puts a lot of diplomatic (and emotional) investment into ASEAN at the regional level. It sees the grouping as a cushion  against the potentially bruising impact of major power competition. The ASEAN-centric architecture has evolved into three supra-regional institutions (the ASEAN Regional Forum, the East Asia Summit, and the ASEAN Defence Ministers’ Meeting Plus), each expected to tie the major powers into regional norms and institution-building efforts, and mitigate their predatory power-politics behaviours. The goal isn’t to avoid competition—some is inevitable—but to prevent competition sliding into conflict. But, has that approach been successful? One measure of success is ASEAN’s unity  and centrality , with Indonesia at its bedrock. ASEAN has been the ‘cornerstone ’ of Indonesia’s foreign policy and will remain so. But the importance Jakarta accords to ASEAN is nuanced  from time to time. And the utility of ASEAN to further Indonesia’s regional interests has its limits, as demonstrated in the 2012 ASEAN Foreign Ministers Meeting . Moreover, ASEAN hasn’t really succeeded in diluting escalating major power rivalries in Asia. And Indonesia itself, well on its way to becoming a major power , might be surreptitiously engaged in a strategic competition that it has been trying to avoid. A growing regional profile means little, however, if it doesn’t align with Indonesia’s national interests at the national level. The history of Indonesia’s use of force beyond its national borders from Konfrontasi to East Timor has demonstrated that regionalism doesn’t trump nationalism and national interests. Growing concerns over its increasingly unstable strategic environment led Jakarta to come up with unilateral initiatives, such as the concept of dynamic equilibrium  and the Indo-Pacific Treaty of Friendship and Cooperation  [PDF]. At the heart of the matter are the South China Sea disputes. While those are largely confined to Indonesia’s far north , they’ve prodded Indonesia to become more diplomatically  and militarily  assertive. Seen in this light, a critical question is whether Indonesia would abandon the non-alignment stance  as embodied in its free and active (bebas aktif) foreign policy. Growing competition between major powers could undermine Indonesia’s non-alignment stance. But being strictly non-aligned  [PDF] wouldn’t be in Indonesia’s best interest either. Interestingly, bebas aktif  can be defined more loosely and flexibly. While a formal alliance is absolutely out of the question, anything short of it is possible. That allows Indonesia to build a set of bilateral defence and military relationships with partner countries that differ in both quantity and quality, as best suits Indonesia’s interests. The manoeuvring room in constructing those relationships isn’t great, not least because it’s contingent upon factors at the sub-national or domestic level. In democracies, all politics, including international politics, is domestic . Democracy allows more voices from within Indonesia to be heard, with nationalism  and Islam  being two dominant ones. As can be seen from Indonesia’s recent election campaigns, both are laden with anti-Western sentiment, which militates against  Indonesia’s becoming too close to the West. That factor is sometimes aggravated by intense bureaucratic politics and turf battles. The TNI and the Foreign and Defence Ministries harbour different views  on Indonesia’s strategic policy, which may or may not be bridged. This is where the personal role  of a ‘strategic’ individual, such as the President, can be important. It’s the responsibility of political leaders to lead domestic opinion and the bureaucracy in favour of what he or she thinks would be in the country’s best interest. While heads of state are certainly opinion-makers, they’re not necessarily opinion-leaders. The challenge of shaping and leading domestic opinion is greater in a democratic Indonesia than it was in New Order days. Strategically sensible policies might not always be accepted domestically. 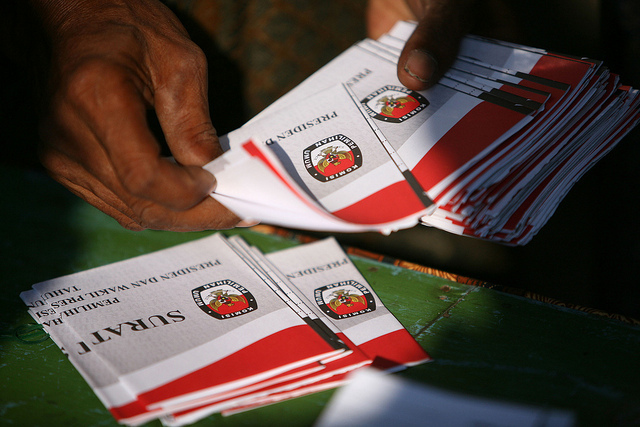 Still, Indonesia’s strategic policy is one of the major challenges that await Indonesia’s next president. And that’s why the July presidential election matters—not only to Indonesians, but equally, to the region and beyond. Ristian Atriandi Supriyanto is an Indonesian visiting fellow at ASPI. Image courtesy of Department of Foreign Affairs and Trade .